The state Senate will carefully study the $34.1 billion General Fund Budget for Fiscal Year 2019-2020, which was unveiled by Governor Tom Wolf on Tuesday before a joint session of the General Assembly. The Governor’s budget proposal includes a $927.3 million increase in state spending from the current fiscal year. The Governor is not requesting a broad-based tax increase this year, but is continuing to push for a Marcellus Shale extraction tax and a fee for municipalities that rely on State Police for local police coverage. To read more, click here. To preview the Governor’s 2019-2020 Executive Budget, click here. On Wednesday, February 13th, I will join WKOK’s “On The Mark” with Program Director and host Mark Lawrence. The program will air live beginning at 8:30AM. During the program I will discuss a number of important state-related issues and take calls from area listeners. Listeners can participate in the live program by calling 1-800-795-WKOK or by email at onthemark@wkok.com. Legislation to ensure that public employees, including lawmakers, who commit job-related felonies are stripped of their taxpayer-funded pension was unanimously approved by the state Senate. Senate Bill 113 would require pension forfeiture if an employee or official is convicted of, or pleads guilty, or no contest to any felony offense related to his or her employment. To read more, click here. During a bipartisan event this week at the Capitol, legislation was unveiled that would create a tax credit for donations made to pediatric cancer research centers. The bill would help generate up to $100 million to fight pediatric cancer over the next 10 years. Another measure will help Intermediate Units purchase telepresence equipment to allow homebound students to interact with their classes remotely. To view the press conference, click here. The Senate Game & Fisheries Committee on Tuesday approved legislation that would empower the Pennsylvania Game Commission to allow Sunday hunting. Senate Bill 147 also would amend the Pennsylvania Game Code to address the offense of trespass while hunting. It would make the violation a primary offense and as well as increase the penalties. Other Bills Receiving a Senate Vote This Week Include…. Senate Resolution 20 urges the Supreme Court to delay action on its proposed changes to medical malpractice reform so that implications for medical care and the economy can be examined. The Senate voted 31-18 for the resolution. Senate Bill 9 designates the Eastern hellbender as the official amphibian of the Commonwealth. This bill now moves to the House State Government Committee for consideration. Senate Bill 145 amends the Agricultural Area Security Law to provide for restrictions and limitations on preserved farmland. The bill would allow owners of preserved farmland to voluntarily relinquish their right to “construct” an additional residence on that property. For example, there are situations where a residence already exists on a property, but an existing residence cannot be subdivided because it is not being “constructed,” according to current law. This legislation will clarify that a subdivision for the purpose of a residence is permitted, regardless of whether it “exists” or needs to be “constructed.” The bill was sent to the Senate Appropriations Committee for review. State FFA Officers joined Senator Elder Vogel (left) and Senator Gene Yaw in Harrisburg on Monday. 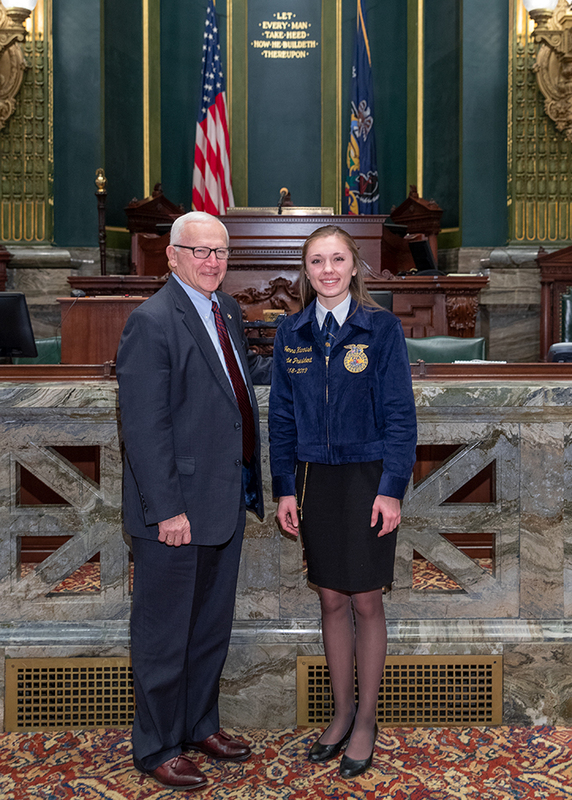 State FFA President Jenna Harnish joins Sen. Gene Yaw in the state Senate Chamber on Monday. 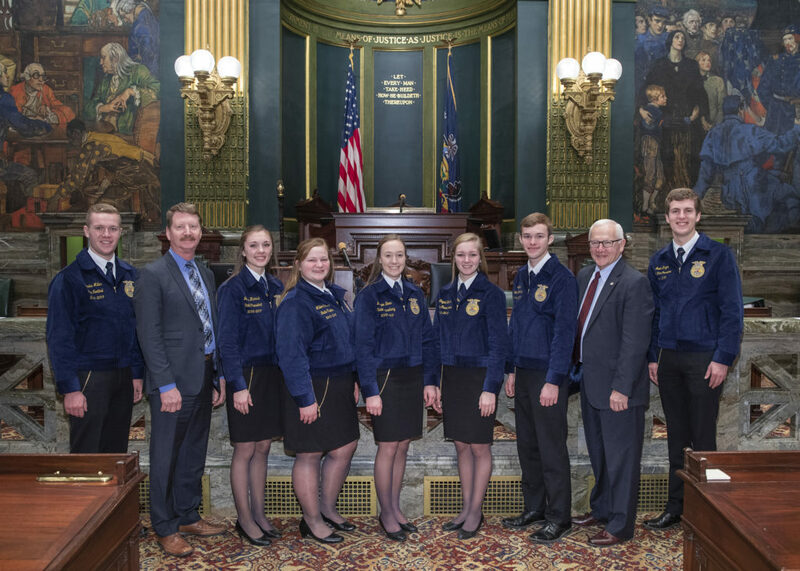 Harnish and state FFA officers were at the State Capitol to support a Senate Resolution, which designates the week of Feb. 16-23, as “FFA Week” in Pennsylvania. A Senate resolution, which I cosponsored, will designate the week of Feb. 16-23, 2019 as “FFA Week” in Pennsylvania. FFA’s all across Pennsylvania are helping to foster a new generation of farmers, teachers and entrepreneurs. Agriculture today is multifaceted and innovative, and that is why it is so good to see this organization training our future leaders to move the state’s agriculture and agri-businesses forward into the 21st century. 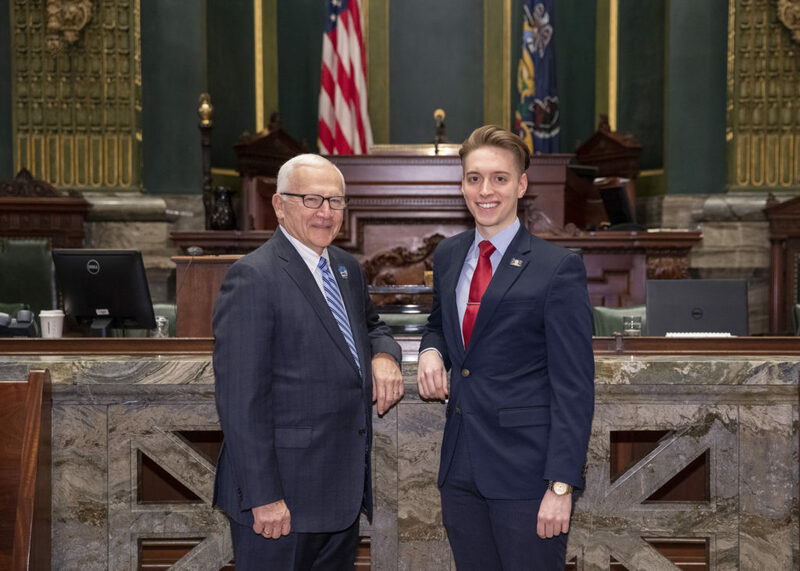 On Tuesday, I invited my Williamsport District Office Intern, Michael Dressler of Northumberland, to come to Harrisburg and hear the Governor’s 2019-20 budget proposal. Michael is a senior at Lycoming College majoring in Philosophy and minoring in Political Science. Upon graduation in May, Michael plans to attend law school and pursue a career in public service. This week, I joined my colleagues in the Senate to support a pair of resolutions designating February 10-16, 2019 as Cardiac Rehabilitation Week in Pennsylvania and March 10-16, 2019 as Pulmonary Rehabilitation Week in the state. 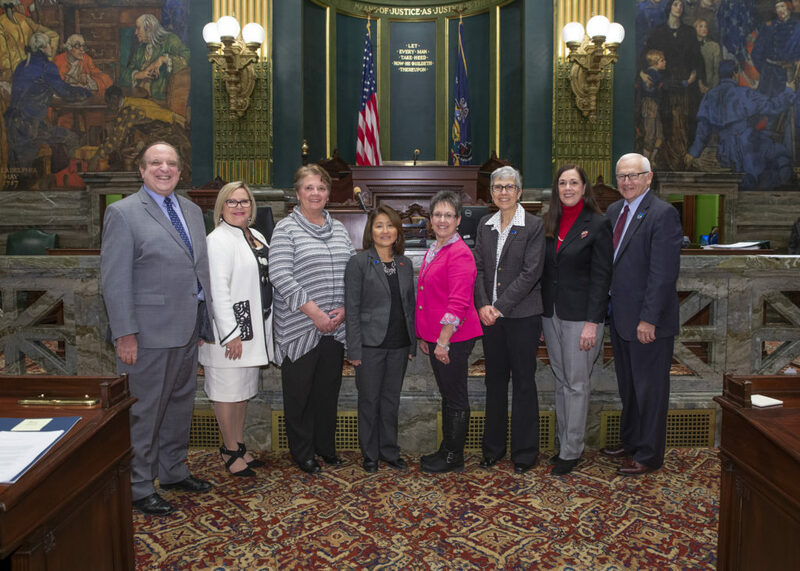 Pictured prior to the Senate vote are Sen. Andrew Dinniman (D-19); Sen. Judy Ward (R-30); Vicki Krebs, RN, Evangelical Community Hospital; Ruth Akers, RN, Bryn Mawr Hospital/Main Line Health; Denise Sheffield, RN, J.C. Blair Memorial Hospital; Nadine Greco MS,FAACVPR, Wayne Memorial Hospital; Sen. Lisa Baker (R-20) and Sen. Gene Yaw (R-23). By spanning across the entirety of Northern Pennsylvania, including Bradford County, the PA Route 6 Heritage Corridor connects a collection of various landscapes, communities, and cultures. And, positioned throughout the vista-filled path of the Route 6 Corridor, are a wide-array of attractions, museums, and tours that highlight the rich historical and cultural background of rural Pennsylvania. 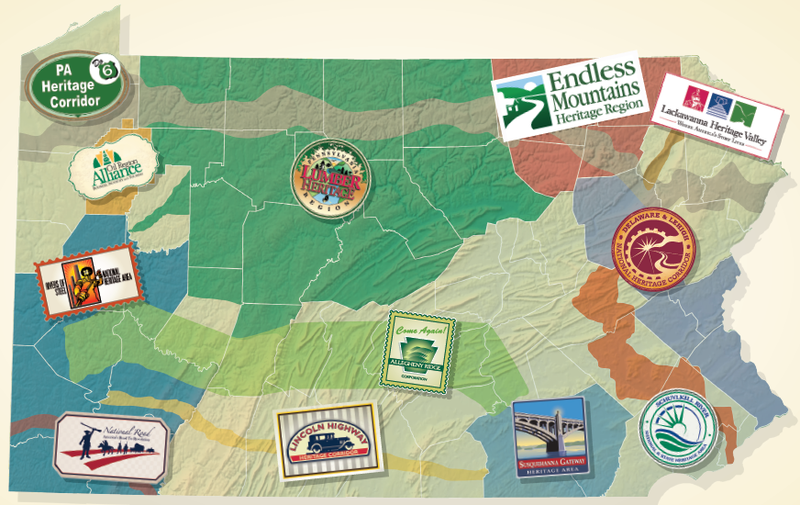 Of the over two-dozen attractions that are available through the Route 6 Corridor, they include such destinations as the Pennsylvania Lumber Museum, Struthers Library Theater, and Allegheny National Forest. The purpose and goal of attractions such as these is to reveal the driving force of both Pennsylvania and the United States, whether that be through the exploration of the lumber industry, the arts, or the beautiful forested environment. If this scenic educational experience sounds of interest to you, you can find more information about the PA Route 6 Heritage Corridor and all of its various attractions here. And to see what areas of Pennsylvania are included along the Route 6 Corridor, a map of this and other Heritage Areas can be found here.